All pens delivered from this project are being upgraded with the American made, 100% stainless steel retracting mechanism made by Tuff Writer MFG. Through four months of development I continually tested this design to make sure I had all of the quality issues worked out. In the last few days however I started to have doubts about the German made Schmidt retracting mechanism. Because of my ‘no compromise’ policy, I felt I could not deliver a pen that might have a reliability problem. I consulted with Jack Roman (a great guy by the way) of Tuff Writer MFG who has agreed to supply us with his greatly improved retracting mechanism. 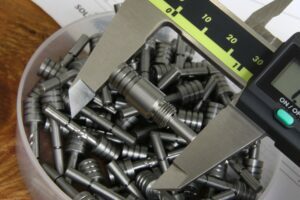 Dimensionally it is a drop-in replacement for the Schmidt mechanism but has overcome the reliability problem by making it with an improved raceway and 416 stainless steel. All pens will be upgraded to this higher quality and more expensive mechanism at no additional cost to the backers. We are working to update the images and video to reflect this upgrade and will post another update when they are up. Project Goal Reached – Thank You to All Our Backers!